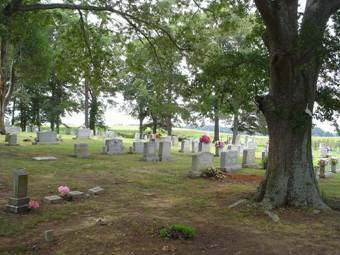 To reach the Walston Cemetery from Florence, Alabama, travel west on Alabama Highway 20 for 3.3 miles. Turn left (west) onto County Rd. 14 (Waterloo Rd.) and travel 5.4 miles to the community of Oakland, Alabama. Turn left (south) onto County Rd. 15 and go about 1.1 mile to the cemetery on the right about 100 yards off the road. This is a picture of the oldest portion of the cemetery. Notice the pile of rocks marking a grave. Also note the other concrete structure in the background. This picture shows a small portion of the black section. 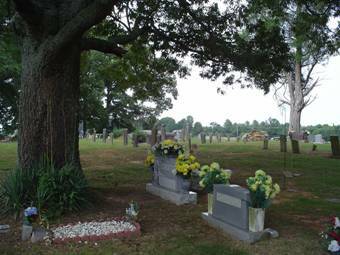 The Walston cemetery is in western Lauderdale County, Alabama. This is a relatively old cemetery with the oldest known burial being Elizabeth Walston in 1830. Another indicator of the age of this cemetery is the very large old trees shown in the accompanying photos. The name of this cemetery obviously came into being due to the Walston family name. There are approximately 30 to 35 unidentified graves in the white section and the black section has numerous sunken areas that obviously are graves with no markers. These probably are the final resting places of slaves. The following records were taken from the headstones and/or foot markers. Abernathy, Barbara A; b. 12 Jul 1955, d. 02 Jan 1976, Black Sec. Ammann, Richard; b. 12 Apr 1890, d. 14 Mar 1975, White Sec. Angel, Ella; b. 14 Feb 1868, d. 09 Apr 1892, 1st wife of Robert E., White Sec. Angel, Ester F.; b. 20 Jun 1888, d. 04 Dec 1902, daughter of Robert E. & Ella, White Sec. Angel, Mamie E. (Sherrod); b. 23 Feb 1869, d. 13 Sep 1921, 2nd wife of Robert E., White Sec. Angel, Mary S.; b. 11 Apr 1905, d. 05 Aug 1905, White Sec. Angel, Robert E.; b. 23 Mar 1856, d. Jul 1917, husband of Ella, White Sec. Armstead, Arthur L.; b. 01 May 1916, d. 18 May 2008, Black Sec. Armstead, MacArthur; b. 24 Aug 1943, d. 17 Sep 1996, Black Sec. Armstead, Revell; b. 1949, d. 1950, Black Sec. Armstead, Sarah (Winburn); b. 30 May 1921, d. 06 Dec 1995, Black Sec. Beloat, William D.; b. 23 Feb 1829, d. 30 Dec 1859, White Sec. Blalock, M. L.; b. 24 May 1859, d. 28 Dec 1887, wife of H. F., White Sec. Blanton, Brenda (Fowler); b. 01 Jul 1948, only date, wife of Thomas Heston, m: 03 Jul 1974, White Sec. Blanton, Thomas Heston; b. 12 Sep 1939, d. 28 Sep 2008, husband of Brenda (Fowler White Sec. Boyd, Rachel W; b. 1918, d. 1958, Black Sec. Brewer, Pearl W.; b. 25 Jun 1906, d. 16 Apr 1999, White Sec. Bumpass, Eliza A.; b. 04 Jul 1820, d. 02 Feb 1846, White Sec. Bumpass, Martha C.; b. 11 Jul 1845, d. 09 Jun 1846, White Sec. Burkhead, Robert E.; b. 16 Aug 1900, d. 05 Mar 1969White Sec. Burkhead, Viola E.; b. 07 Nov 1909, d. 03 Mar 1996, White Sec. Call, Amanda C.; birth date not legible, d. 14 Sep 1875, White Sec. Call, Beulah L.; b. 1884, d. 1972, wife of Solomon L., White Sec. Call, Caroline E.; b. 29 Aug 1822, d. 26 Jan 1879, wife of Hezekiah, White Sec. Call, Clara D.; b. 1926, d. 1928, White Sec., White Sec. Call, Elizabeth R.; b. 26 Aug 1912, d. 17 Aug 2000, White Sec. Call, Ervin H.; b. 07 Jan 1922, d. 01 Jan 2009, husband of Frances (Crosswhite), White Sec. Call, Floyd W.; b. 1910, d. 1956, White Sec. Call, Frances; b. 1923, White Sec. Call, Gail W.; b. 18 Aug 1950, wife of H. Eugene, m: 28 Aug 1971, White Sec. Call H. Eugene; b. 26 Sep 1944, husband of Gail W., White Sec. Call, Horace E.; b. 06 Mar 1910, d. 10 Jun 1967, White Sec. Call, infant; b. 20 Jul 1883, d. 02 Aug 1883, White Sec. Call, Margaret T.; b. 27 Apr 1845, d. 05 Aug 1878, wife of W. H., White Sec. Call, Mary E.; b. 22 Mar 1849, d. 15 Oct 1878, White Sec. Call, Solomon L.; b. 1884, d. 1958, White Sec. Call, Samantha V.; b. 04 Jun 1870, d. 22 Sep 1887, daughter of R. T. & M. E., White Sec. Call, Thomas R.; b. 05 Jun 1871, d. 06 Sep 1871, son of W. H., White Sec. Carroll, Nellie Mae; b. 13 Jan 1967, d. 17 Oct 2014, Black Sec. Carroll, William “Chopper”; b. 29 Dec 1965, d. 12 Feb 1995, Black Sec. Carroll, Xavier Oneal; b. 03 Sep 2000, d. 03 Sep 2000, son of Nellie, Black Sec. Chandler, Mable Inez; b. 20 Jul 1934, d. 10 May 1999, wife of Thomas C., m: 01 Aug 1953, White Sec. Chandler, Thomas C.; b. 16 Apr 1930, d. 12 Jan 1999, husband of Mable Inez, White Sec. Clemons, Elizabeth D.; b. 12 Feb 1921, d. 28 Jan 2004, wife of Hubert Ray, White Sec. Clemons, Hubert Ray; b. 06 Sep 1913, d. 28 Feb 1991, husband of Elizabeth D., White Sec. Cliff, Fred J.; b. 01 Jan 1892, d. 20 Feb 1959, MA 2D Lt. US Army WWI, White Sec. Cliff, Gertrude A.; b. 29 Sep 1894, d. 05 Oct 1970, wife of Fred J., White Sec. Clingan, Mary (Rice); b. 15 Nov 1917, d. 07 Nov 2011, wife of William M. Sr., White Sec. Clingan, Patricia (Rowland); b. 05 Jan 1951, wife of William Marvin, White Sec. Clingan, William M.; b. 17 Mar 1905, d. 20 May 1989, White Sec. Clingan, William Marvin Jr.; b. 08 Apr 1947, husband of Patricia, White Sec. Cooper, Dalton C.; b. 23 Jul 1928, d. 20 Nov 1935, White Sec. Cooper, Ethel Inez; b. 25 Oct 1923, d. 13 Jul 2001, White Sec. Cooper, George W.; b. 01 Jan 1880, d. 21 Apr 1934, White Sec. Cooper, Madgie L.; b. 14 Apr 1889, d. 21 Mar 1976, White Sec. Cooper, Odell; b. 13 Oct 1914, d. 15 Jan 1923, son of G. W. & M. E., White Sec. Cooper, Reba L.; b. 23 Feb 1922, d. 04 Oct 1922, daughter of G. W. & M. E., White Sec. Cox, Bessie L.; b. 17 Feb 1900, d. 10 May 1984, White Sec. Cox, Catherine Joyce; b. 23 Apr 1938, d. 05 Jan 2000, White Sec. Cox, Ella; b. 03 Apr 1895, d. 30 Nov 1944, daughter of J. Key & Mary, White Sec. Cox, infant; b. 29 Jan 1890, d. 31 Jan 1890, daughter of W. R. & M. R., White Sec. Cox, J. Key; b. 10 Jan 1870, d. 07 Feb 1927, husband of Mary, White Sec. Cox, James H.; b. 15 Sep 1895, d. 02 Jan 1978, White Sec. Cox, Jimmy Porter; b. 02 Jul 1935, d. 08 Jan 1951, son of Marvin & Katherine, White Sec. Cox, Katherine R.; b. 07 Aug 1911, d. 08 Sep 1996, White Sec. Cox, Lee; b. 30 Nov 1902, d. 16 Aug 1938, son of J. Key & Mary, White Sec. Cox, Lester; b. 06 Jun 1891, d. 16 Nov 1896, son of W. R. & M. R., White Sec. Cox, Lillie M.; no dates, White Sec. Cox, Marvin Porter; b. 10 Aug 1904, d. 21 Apr 1977, White Sec. Cox, Mary; b. 17 Feb 1876, d. 10 Apr 1963, wife of J. Key, White Sec. Cox, Ollie M.; b. 07 Feb 1914, d. 17 Jun 1995, White Sec. Cox, Owen E.; b. 25 Jun 1911, d. 24 Nov 1966, White Sec. Cox, Reeder; b. 14 Jan 1861, d. 16 Oct 1900, White Sec. Cox, Tennen; b. 17 Apr 1907, d. 14 Jul 1914, son of J. Key & Mary, White Sec. Cox, William R.; b. 07 Jun 1884, d. 30 Jun 1934, White Sec. Cox, William Horace; b. 23 Dec 1930, d. 22 Jan 1997, White Sec. Cox, Wylodine; b. 06 Sep 1893, d. 24 Mar 1985, White Sec. Cromwell, Ada H.; b. 23 Nov 1905, d. 27 Sep 1977, White Sec. Cromwell, Ada Madolah; b. 08 Sep 1918, d. 24 Jan 2004, wife of Charles Lacy, White Sec. Cromwell, Charles Lacy; b. 29 Mar 1918, d. 13 Sep 1990, husband of Ada Madolah, White Sec. Cromwell, Danny Ray; b. 27 Dec 1959, d. 28 Feb 1960, White Sec. Cromwell, Henry E.; b. 12 Jan 1906, d. 25 May 1971, White Sec. Cromwell, Jamie Elizabeth; b. 23 May 1988, d. 01 Aug 1988, White Sec. Cromwell. Jerry Lindall; b. 18 Oct 1960, d. 10 Feb 2000, White Sec. Cypert, Cora E.; b. 30 May 1878, d. 07 Jan 1968, White Sec. Cypert, J. A.; b. 1849, d. 1935, White Sec. Cypert, Mattie V.; b. 06 Dec 1883, d. 22 Aug 1970, White Sec. Cypert, Susie; b. 1851, d. 1935, White Sec. Danley, Jim; b. 25 Jan 1947, White Sec. Darby, Johnnie Ruth; b. 09 Oct 1927, d. 15 Apr 1980, White Sec. Darby, Thomas White; b. 24 Jun 1933, d. 03 May 1991, White Sec. Davis, Alice (Smith); b. 29 Jul 1911, d. 23 Sep 1987, wife of Lester Allison, White Sec. Davis, Lester Allison; b. 30 Jan 1915, d. 02 May 1960, White Sec. Dewberry, Charles Clyde; b. 04 Sep 1919, d. 22 Apr 2014, husband of 1st Lady Marie, 2nd Jeanette, White Sec. Dewberry, Claude Sr.; b. 29 Apr 1886, d. 16 Oct 1975, husband of Edna V., White Sec. Dewberry, Edna V.; b. 14 Jun 1898, d. 22 Jan 1952, wife of Claude Sr., White Sec. Dewberry, Homer Claude; b. 16 Feb 1918, d. 21 Jun 2001, White Sec. m: 02 Jul 1938, White Sec. Dewberry, Rachel Violet; b. 17 Feb 1922, d. 02 Dec 2013, wife of Homer Claude, m: 15 Feb 1940, White Sec. Dickey, Danny Ray; b. 16 Jul 1960, d. 02 Nov 1960, son of Mr. & Mrs William Louis Dickey, White Sec. Dickey, William L.; b. 02 Jul 1942, d. 01 May 1986, White Sec. Edwards, Norman “Bob”; b. 11 Oct 1905, d. 15 Mar 1987, White Sec. Edwards, Virginia W.; b. 10 Feb 1910, d. 20 Dec 1995, White Sec. Farrell, Leamon B. Jr.; b. 24 Oct 1921, d. 24 Sep 2003, White Sec. Farrell, Mabel Louise; b. 27 Jul 1925, d. 05 Mar 2001, White Sec. Foust, Charlie B.; b. 12 Sep 1895, d. 05 Feb 1979, husband of Estelle C., Pvt. US Army WWI, White Sec. Foust, Estelle C.; b. 23 Feb 1904, d. 13 Sep 1988, wife of Charlie B., White Sec. Fowler, Helen A.; b. 19 Mar 1931, d. 24 Jun 2005, wife of John W. Jr., White Sec. Fowler, John W. Jr.; b. 29 Jun 1925, d. 16 Aug 1977, husband of Helen A., White Sec. Gibbs, Danylu; b. 1946, d. 1962, White Sec. Gooch, Cecil M.; b. 15 Feb 1924, d. 29 Oct 1982, White Sec. m: 11 Jun 1968, White Sec. Greenwell, Thurman W.; b. 14 Aug 1911, d. 13 May 1981, Pfc. US Army WWII, White Sec. Hall, Anna Leona; b. 16 Sep 1917, d. 20 Jan 1988, White Sec. Hall, E. P.; b. 20 Sep 1859, d. 26 Jan 1937, husband of Ida Myrtle, White Sec. Hall, Effie E. (Rikard); b. 07 Aug 1897, d. 03 Jan 1923, wife of Ira T., White Sec. Hall, Eleanor; b. 31 Dec 1902, d. 07 Mar 1982, White Sec. Hall, Gladys Ruth (Thomason); b. 27 Feb 1896, d. 08 Dec 1922, wife of Robert W., White Sec. Hall, Ida Myrtle (Potterfield); b. 27 Apr 1865, d. 20 May 1941, wife of E. P., White Sec. Hall, Ira T.; b. 27 Apr 1896, d. 01 Jul 1973, husband of Effie E., White Sec. Hall, J. O.; b. 13 May 1888, d. 03 Nov 1918, White Sec. Hall, Lamar P.; b. 20 Oct 1889, d. 11 Oct 1966, White Sec. Hall, Lola (Balentine); b. 16 May 1943, d. 05 Nov 2008, wife of Norman Jr., White Sec. Hall, Maude E.; b. 04 Jan 1891, d. 14 Jul 1975, White Sec. Hall, Murray T.; b. 20 Jun 1913, d. 28 Sep 1941, White Sec. Hall, Norman Lamar; b. 16 Apr 1919, d. 04 Jul 2000, White Sec. Hall, Norman L. Jr.; b. 27 Aug 1944, d. 31 Jan 2011, husband of Lola (Balentine), White Sec. Hall, Robert W.; b. 16 Oct 1899, d. 23 Apr 1988, White Sec. Hall, Susan Rene (Redding); b. 16 May 1957, d. 25 May 1997, White Sec. Hancock, Ella; b. 26 Jun 1874, d. 09 Nov 1948, White Sec. Hancock, Sara; b. 10 Nov 1902, d. 05 Mar 1972, White Sec. Hancock, Thomas A. Rev. ; b. 07 Dec 1861, d. 01 Apr 1943, White Sec. Hannah, Ida R.; b. 15 Jan 1881, d. 08 Jul 1916, White Sec. Hannah, Laura Virginia; b. 12 Aug 1908, d. 12 Oct 1909, White Sec. Harris, Gifford; b. 13 Oct 1924, d. 28 Mar 1990, Black Sec. Harris, Julia, b. 23 Jul 1904, d. 13 Aug 2004, Black Sec. Hayes, Arthella Gertrude (Cooper); b. 09 May 1926, d. 02 Nov 2013, wife of 1st Floyd H. Hayes, 2nd Rexford White, 3rd Cecil Cole, White Sec. Hayes, Floyd H.; b. 10 Oct 1925, d. 26 Aug 1978, Pvt. US Army, White Sec. Hayes, Johnie C.; b. 22 Apr 1905, d. 28 Apr 1980, White Sec. Hayes, Esther (Cooper); b. 14 Jul 1911, d. 26 Jan 1947, White Sec. Higgins, Billy Joe; b. 28 Mar 1935, d. 22 Jul 1960, White Sec. Higgins, Evelyn; Note: burial location unknown, White Sec. Higgins, J. Henry; b. 02 Jun 1892, d. 15 Aug 1961, White Sec. Higgins, Lawrence; b. 05 Aug 1931, d. 18 Oct 2005, brother of Minnie (Talley) White Sec. Higgins, Lomesome Meed; b. 11 Mar 1890, d. 14 Aug 1968, White Sec. Higgins, Mary L.; b. 11 Mar 1921, d. 26 Jan 2001, White Sec. Higgins, Maybell; b. 18 Oct 1925, d. 25 Sep 1981, White Sec. Higgins, Minnie Ida; b. 18 Feb 1897, d. 01 Jun 1974, White Sec. Higgins, Velma S.; b. 15 Nov 1896, d. 30 Jan 1989, White Sec. Higgins, William Joe; d. 22 Jul 1960 Note: burial location unknown, White Sec. Hill, Bobby; 1932, d. 1933, White Sec. Hill, C. C.; b. 18 Nov 1894, d. 04 Jan 1973, White Sec. Hill, Eugene; b. 1933, d. 1934, White Sec. Hill, Helen B.; b. 14 Jun 1916, d. 22 Jun 1925, daughter of J. R. & Julia, White Sec. Hill, infant; b. 1924, d. 1924, White Sec. Hill, Jane; b. 08 Feb 1811, d. 21 Mar 1886, White Sec. Hill, Lena R.; b. 21 May 1906, d. 06 Jan 1973, White Sec. Hill, Liddia Ann; b. 24 Jul 1872, d. 13 Oct 1966, White Sec. Hill, Luther W.; b. 10 Jun 1903, d. 09 May 1936, White Sec. Hill, McKinley; b. 08 Nov 1896, d. 13 Jun 1911, son of W. E. & Liddia, White Sec. Hill, William L.; b. 22 Jul 1867, d. 31 Jan 1940, White Sec. Hipp, A. W.; b. 22 Feb 1892, d. 08 Sep 1920, White Sec. Hipp, Cornelia; b. 25 Jun 1854, d. 08 Oct 1913, wife of John R., White Sec. Hipp, John R.; b. 27 May 1861, d. 28 Jan 1913, husband of Cornelia, White Sec. Holcomb, Elmer P.; b. 11 Feb 1903, d. 17 Oct 1980, Pfc. US Army, husband of Lola Pearl, White Sec. Holcomb, Lola Pearl; b. 25 Jan 1908, d. 17 Sep 1963, wife of Elmer P., White Sec. Hollis, Henry; b. 1888, d. 1952, White Sec. Howie, Andrew H.; b. 10 Jan 1839, d. 21 Oct 1857, White Sec. Howie, Ann M.; b. 29 Jun 1817, d. 23 Jun 1859, White Sec. Howie, Fannie R.; b. 1861, d. 17 Jun 1862, daughter of J. & Mary J. A., White Sec. Howie, John C.; b. 13 Jun 1849, d. 23 Oct 1857, White Sec. Howie, Lucinda L.; b. 04 Dec 1853, d. 05 Oct 1857, White Sec. Howie, Mary J.; b. 02 Sep 1840, d. 20 Sep 1857, White Sec. Howie, Mary J. A.; b. 1830, d. 17 Mar 1869, wife of J., White Sec. Howie, Nancy C.; b. 10 Feb 1847, d. 02 Oct 1859, White Sec. Howie, Thomas S.; b. 1861, d. 16 Apr 1862, son of J. & Mary J. A., White Sec. Howie, William C.; b. 25 Nov 1831, d. 05 Oct 1857, White Sec. Hunt, Johnie B.; b. 18 Jun 1875, d. 25 Jul 1876, White Sec. Hunter, Frances S.; b. 13 Mar 1910, d. 15 Mar 1968, White Sec. Hunter, Tipton R.; b. 01 Aug 1909, only date, husband of Frances S., White Sec. Hurst, Clara A.; b. 06 Jul 1881, d. 08 Jul 1884, daughter of J. M. & Nancy E., White Sec. Hurst, Herman C.; b. 18 Sep 1897, d. 01 Feb 1899, son of W. L. & M. B., White Sec. Hurst, J. M.; b. 17 Oct 1855, d. 10 Jul 1938, White Sec. Hurst, Jackson P.; b. 16 Dec 1859, d. 28 Jan 1886, husband of Lutie A., White Sec. Hurst, Lutie A.; b. 19 May 1860, d. 16 May 1885, wife of Jackson P., White Sec. Hurst, Nancy E.; b. 07 May 1861, d. 25 Feb 1941, White Sec. Irons, Alline W.; b. 28 Nov 1928, d. 25 Apr 1999, White Sec. Irons, Ava Lavern (Thompson); b. 20 Jun 1959, d. 30 May 2008, Black Sec. Johnston, Billy F.; b. 17 Mar 1927, d. 02 Jul 1993, US Navy WWII, White Sec. Jolly, Aaron; no dates, White Sec. Jolly, Ambross Lee; b. 1890, d. 1950, White Sec. Jolly, Connie Ruth; b. 1901, d. 1953, White Sec. Jolly, Homer L.; b. 28 Feb 1908, d. 11 Aug 1970, MSgt AL US Army WWII, White Sec. Jolly, Jane; no dates, White Sec. Jolly, Sarah Alma; b. 26 Oct 1921, d. 03 May 2006, wife of Homer Lee, White Sec. Jolly, William Earl; 1939, only date, White Sec. Jones, Curtis; b. 08 Apr 1913, d. 11 Jul 1937, White Sec. Jones, Edward W.; b. 24 Dec 1901, d. 25 Feb 2001, White Sec. Jones, Guy E.; b. 05 May 1917, d. 23 Oct 1919, White Sec. Jones, Guy; b. 1890, d. 1929, White Sec. Jones, Herman Jr.; b. 07 Sep 1961, d. 22 Feb 2000, Black Sec. Jones, Ida E.; b. 16 Nov 1918, d. 23 Apr 1924, White Sec. Jones, Lina E.; b. 11 Oct 1901, d. 26 Jan 1999, White Sec. Jones, Lizzie; b. 02 Jul 1886, d. 08 Sep 1974, White Sec. Jones, Lola R.; b. 1926, d. 1988, White Sec. Kellie, John; b. 1828, d. 19 Mar 1906, White Sec. Kelly, Mrs. Jaley; b. 08 Feb 1878, d. 11 Nov 1903, White Sec. Kelso, Leon Brown; b. 27 May 1916, d. 07 Jan 2002, White Sec. Kelso, Louise; infant, b. 10 Oct 1953, d. 10 Oct 1953, White Sec. Kimbrough, Blanche Marie; b. 16 Jun 1917, d. 30 Jul 1918, White Sec. Kimbrough, Fannie R.; b. 16 Mar 1861, d. 11 Mar 1933, White Sec. Kimbrough, Florence; b. 20 Apr 1890, d. 05 Aug 1987, wife of R. A., White Sec. Kimbrough, Lee B.; b. 1884, d. 1949, White Sec. Kimbrough, Margie B.; b. 04 Sep 1896, d. 25 Apr 1911, White Sec. Kimbrough, R. A.; b. 06 Jul 1890, d. 05 Nov 1934, husband of Florence, White Sec. Kimbrough, Richard T.; b. 06 Jul 1860, d. 10 Mar 1919, White Sec. Kimbrough, Ruth C.; b. 1893, d. 1973, White Sec. Kimbrough, Willie Pearl; b. 07 Dec 1910, d. 24 Feb 1922, White Sec. Kirkland, Lola Christine H.; b. 11 Jan 1921, d. 07 May 2013, wife of John Beverly, White Sec. Kirkland, John Beverly; b. 22 Jan 1920, d. 07 Sep 1991, White Sec. Kirkman, Ida Mae; b. 12 Jul 1951, d. 24 Oct 2014, Black Sec. Kirkman, Tommy Edward; b. 1949, d. 31 Jul 2000, Black Sec. Lambert, A. C.; b. 22 Dec 1921, d. 14 Apr 2006, husband of Dorothy, White Sec. Lambert, Dorothy D.; b. 20 Mar 1934, White Sec. Lambert, Travis W.; b. 04 Apr 1949, d. 28 Jul 2003, White Sec. Lanier, Charles M.; b. 1840, d. 1909, husband of Martha J., White Sec. Lanier, James A.; b. 23 Oct 1879, d. 13 Feb 1880, son of Charles M. & Martha J., White Sec. Lanier, Josie Bell; b. 19 Sep 1892, d. 09 Jul 1974, White Sec. Lanier, Martha J. (Hurst); b. 17 Nov 1852, d. 19 Jan 1895, wife of Charles M. m: 12 Jan 1873, White Sec. Lanier, Willie J.; b. 07 Jan 1878, d. 06 Oct 1878, son of Charles M. & Martha J., White Sec. Lee, Houston T.; b. 11 Sep 1897, d. 25 Dec 1962, husband of Mattie L., White Sec. Lee, Mattie L.; b. 14 Feb 1900, d. 14 Apr 1955, wife of Houston T., White Sec. Liles, Annie A.; b. 03 Oct 1900, d. 01 Dec 1976, wife of Rufus L., White Sec. Liles, Barney R.; b. 20 Sep 1922, d. 11 Apr 1995, US Navy WWII, husband of Inez L., White Sec. Liles, Inez L.; b. 19 Aug 1930, wife of Barney R., m: 15 Oct 1948, White Sec. Liles, James William; b. 30 Oct 1920, d. 06 Jan 1994, PHM2 US Navy WWII, White Sec. Liles, Rufus L.; b. 17 Sep 1892, d. 19 Oct 1939, husband of Annie A., White Sec. Lindsey, Barbara S.; b. 28 Aug 1938, only date, White Sec. Lindsey, Clyde W.; b. 16 Nov 1890, d. 07 Nov 1968, husband of Isola, White Sec. Lindsey, Henry Barbee; b. 07 Jan 1860, d. 05 Oct 1935, husband of Lizzie E., White Sec. Lindsey, Isola; b. 31 May 1896, d. 31 Dec 1937, wife of Clyde W., White Sec. Lindsey, Lizzie E.; b. 10 Feb 1860, d. 27 Apr 1916, wife of Henry Barbee, White Sec. Lindsey, Nathan G.; b. 28 Apr 1939, d. 15 Jun 2008, Pvt. US Army, White Sec. Lovelace, Parilee (Paulk); b. 1913, wife of Sidney Johnson Lovelace White Sec. Lovelace, Sidney Johnson; b. 1903, d. 25 Jan 1960, White Sec. Malone, Fannie (Turnley); b. 01 Aug 1881, d. 19 Sep 1886, daughter of M. & E. J., White Sec. Malone, James T.; b. 1876, d. 30 Oct 1879, White Sec. Malone, John M.; b. 1869, d. 06 Dec 1879, son of M. & E. J., White Sec. Marshall, Lloyd Braden; b. 11 Oct 1959, d. 28 Mar 1988, White Sec. May, Ella; no dates, died at age 34, White Sec. May, Lizzie N.; b. 08 Feb 1874, d. 27 Aug 1931, White Sec. May, William “Bud”; b. 16 Dec 1903, d. 18 Jan 1968, White Sec. McCullough, Sarah Ethel (Cox); b. 12 Jan 1928, d. 11 Oct 2006, wife of Abilene Ray, White Sec. McDonald, Alice (Vaughan); b. 25 Nov 1905, d. 11 Jun 2006, wife of William Abner, White Sec. McDonald, Douglas E.; b. 27 Nov 1929, d. 06 Aug 1982, GM2 US Navy, Korea, White Sec. McDonald, John Robert Sr.; b. 24 Dec 1931, d. 12 Nov 1998, FN US Navy, Korea, White Sec. McDonald, William A.; b. 10 Apr 1899, d. 09 Dec 1971, husband of Alice V., White Sec. McGinnis, Myrtle E.; b. 12 Feb 1917, d. 12 Aug 1987, White Sec. McIntyre, Christiana; b. 01 Mar 1789, d. 15 Jul 1847, wife of Malcom, White Sec. McIntyre, Duncan; b. 05 Mar 1816, d. 02 Nov 1851, White Sec. McIntyre, infant; b. 1880, d. 1880, daughter of J. L. & Sarah E., White Sec. McIntyre, J. D.; b. 03 Sep 1869, d. 09 Dec 1885, son of J. L. & Sarah E., White Sec. McIntyre, James Gilbert; b. 01 Oct 1817, d. 05 Sep 1836, White Sec. McIntyre, Malcom; b. 12 Oct 1777, d. Aug 1824, husband of Christiana, White Sec. McIntyre, Nancy E.; b. 14 Nov 1808, d. 01 Aug 1834, White Sec. McIntyre, Olen B.; b. 19 Nov 1875, d. 18 Mar 1879, son of J. L. & Sarah E., White Sec. McIntyre, Sarah E.; b. 23 Feb 1846, d. 09 Jul 1898, wife of J. L., White Sec. McKelvey, Billie J.; b. 24 Dec 1931, d. 09 Oct 1986, SFC US Army Korea, Vietnam, White Sec. McKelvey, Lee; b. 08 Sep 1959, d. 28 Aug 1978, son of Bill & Wyllodene, White Sec. Miles, Ema Fae (Weaver); b. 12 Feb 1933, d. 17 Aug 1996, White Sec. Miles, Rena Bell; b. 13 Jan 1900, d. 21 Jul 1981, White Sec. Miles, Thomas F.; b. 26 Jan 1894, d. 07 Apr 1944, White Sec. Miles, William T. Sr.; b. 23 Nov 1919, d. 24 Jul 1997, US Army WWII, White Sec. Miller, Donnie L. Jr.; b. 28 Oct 1970, d. 29 Oct 1970, White Sec. Mitchell, Alta (Sherrod); b. 17 Jun 1897, d. 15 Apr 1973, White Sec. Mitchell, infant; b. 26 Jan 1964, daughter of Mr. & Mrs. James Mitchell, White Sec. Morrow, Bryan Edward; d. 02 Feb 2012, White Sec. Murdock, Luther Green; b. 16 Jun 1916, d. 13 May 1988, Pfc. US Army WWII, White Sec. Murdock, Luther “Luke” Jr.; b. 28 Jul 1945, d. 16 Aug 2010, White Sec. Murdock, Ruby L.; b. 07 Mar 1920, d. 28 Mar 2004, wife of Luther Green, White Sec. Murdock, Samuel M.; b. 11 Nov 1949, d. 13 Feb 2008, White Sec. Murphy, Mary (Underwood); b. 23 Nov 1944, only date, wife of Richard Owen, White Sec. Murphy, Richard Owen; b. 22 Jun 1944, d. 21 Oct 2000, husband of Mary, White Sec. Murphy, Walter Glenn Sr.; b. 28 Apr 1917, d. 26 Dec 2008, US Army Air Forces WWII, White Sec. Murphy, Wanda (Rice); b. 31 May 1922, only date, wife of Walter Glenn Sr., m: 07 Jun 1940, White Sec. Olive, Blanch K.; b. 30 Jan 1894, d. 05 Jun 1966, White Sec. Olive, Claud C.; b. 1905, d. 1918, White Sec. Olive, Jones H.; b. 1845, d. 1917, Civil War Veteran under Nathan Bedford Forrest, White Sec. Olive, Lou A.; b. 14 Sep 1876, d. 22 Mar 1960, wife of Jones H., White Sec. Olive, Odus T.; b. 30 Nov 1909, d. 15 Dec 1992, White Sec. Olive, Pearl; b. 1902, d. 1902, White Sec. Olive, Ruby G.; b. 1899, d. 1900, White Sec. Paulk, Alice A.; b. 1879, d. 1972, White Sec. Paulk, Esther (Walker); b. 23 May 1903, d. 29 Oct 1965, White Sec. Paulk, Frank David; b. 21 Sep 1933, d. 25 Sep 1961, White Sec. Paulk, J. Pugh; b. 1863, d. 1940, White Sec. Paulk, L. Bradford; b. 19 Mar 1904, d. 03 Mar 1973, White Sec. Perkines, Willie; b. 27 Jan 1869, d. 19 Mar 1916, Black Sec. Pipkins, Fannie L.; b. 06 Mar 1908, d. 04 Oct 1985, White Sec. Poole, John Paul. ; b. 10 Jul 1933, d. 12 Jul 2010, husband of Sandra (Farmer), White Sec. Poole, Sandra (Farmer); b. 13 Jul 1948, only date, wife of John Paul, m: 16 Jan 1980, White Sec. Pruitt, infant; 20 Mar 1961, no other information, White Sec. Ragland, Elizabeth W.; b. 1916, d. 1937, Black Sec. Raney, Edith Josie; b. 17 May 1919, d. 22 Nov 1989, wife of Samuel Elmer, White Sec. Raney, Rufus L. “Boots”; b. 26 May 1940, d. 03 Nov 2006, husband of Pam, White Sec. Raney, Samuel Elmer; b. 04 Jun 1915, d. 05 Oct 1979, husband of Edith Josie, White Sec. Ray, Alphia Omega; b. 22 Dec 1900, d. 11 Apr 1998, White Sec. Ray, Ida Flynt; b. 26 Jul 1870, d. 25 Jul 1949, White Sec. Reed, Albert A.; b. 31 Jul 1934, d. 12 Jun 2009, Pvt. U.S. Army, White Sec. Reed, Elizabeth (Brewer); b. 26 Sep 1946, d. 23 Feb 2016, wife of Albert A., m: 04 Jan 1966, White Sec. Rhodes, Roland R.; b. 26 Nov 1958, d. 21 Nov 1990, husband of Vanessa O., White Sec. Rice, Alma Ruth; b. 29 Oct 1924, only date, White Sec. Rice, Eleanor C.; b. 07 Oct 1922, d. 06 Mar 2008, White Sec. Rice, Elizabeth; b. 1790, d. 12 Jul 1829, White Sec. Rice, Elsie Mae; b. 21 Dec 1905, d. 13 Apr 1984, White Sec. Rice, Erline; b. 09 Mar 1908, d. 28 Dec 2008, White Sec. Rice, Hugh L.; b. 19 Jan 1888, d. 13 Oct 1967, White Sec. Rice, Hugh L. Jr.; b. 14 Apr 1916, d. 03 Apr 2001, White Sec. Rice, John R.; b. 16 Aug 1876, d. 12 May 1947, White Sec. Rice, Mamie C.; b. 23 Sep 1898, d. 28 Nov 1984, White Sec. Rice, Mary F.; b. 13 Feb 1883, d. 27 Apr 1976, White Sec. Rice, Richard; b. 1794, d. 30 Jun 1853, White Sec. Richardson, Charlie L.; b. 16 Dec 1889, d. 18 Jun 1967, White Sec. Richardson, Dorothy Lee (Miles); b. 01 Nov 1921, d. 23 Apr 2014, wife of George A.
Richardson, Elizabeth E.; b. 18 Nov 1950, d. 26 Nov 1950, White Sec. Richardson, Georgie A. (Whitten); b. 20 Jan 1894, d. 16 Jan 1923, wife of J. W., White Sec. Richardson, Henry A.; b. 03 Jan 1897, d. 21 Dec 1968, husband of Lucille, AL Pvt. US Army WWI, White Sec. Richardson, J. Harold; b. 08 Jan 1943, d. 04 Jan 1966, White Sec. Richardson, Jack Sr.; b. 17 Oct 1942, only date, White Sec. Richardson, James F.; b. 26 Jun 1930, d. 04 Jun 1975, son of Mr. & Mrs. C. L., White Sec. Richardson, Kenneth M.; b. 11 Feb 1956, d. 01 Nov 1973, White Sec. Richardson, Linda Sue; b. 17 Sep 1945, d. 14 Jul 1997, White Sec. Richardson, Lucille; b. 31 May 1938, only date, White Sec. Richardson, Norman Howard; b. 27 Feb 1943, d. 27 Jul 1989, White Sec. Richardson, Robert P.; b. 21 Apr 1934, d. 07 Feb 1935, son of Mr. & Mrs. C. L., White Sec. Richardson, Roxie B.; b. 31 Dec 1899, d. 25 Dec 1987, White Sec. Richardson, Sophoine K.; b. 27 Aug 1917, d. 10 Sep 1917, daughter of C. W. & A., White Sec. Richardson, Thomas M.; b. 01 May 1935, d. 04 Dec 2008, husband of Lucille, White Sec. Rickard, Annie (Hall); b. 29 Oct 1901, d. 10 Oct 1988, White Sec. Rickard, Barbara Ann; b. 28 Jan 1936, d. 18 Apr 2016, White Sec. Rickard, Eleanor Ruth; b. 12 Jan 1926, d. 13 May 1927, White Sec. Rickard, Lawrence H.; b. 15 Jun 1903, d. 20 Mar 1980, White Sec. Rickman, James Garland; b. 18 Sep 1925, d. 28 Jan 1980, S1 US Navy WWII, White Sec. Rickman, Luna (Ammann); b. 01 Mar 1924, only date, White Sec. Rickman, Richard; b. 12 Apr 1890, d. 14 Mar 1975, White Sec. Rikard, Ethel C.; b. 1875, d. 1958, wife of Sidney M., White Sec. Rikard, Sidney M.; b. 1872, d. 1949, White Sec. Roberts, Helen B.; b. 27 Jul 1922, d. 08 Apr 2005, wife of Thomas F., White Sec. Roberts, Thomas F; b. 07 May 1918, d. 29 Jun 1990, husband of Helen B., White Sec. Robinson, Alonzo D.; b. 12 May 1887, d. 22 May 1944, White Sec. Robinson, Phillip Nolen; b. 07 Dec 1917, d. 01 May 1989, Pfc. US Army WWII, White Sec. Robinson, Velma E.; b. 28 Nov 1885, d. 17 Nov 1967, White Sec. Robinson, Wernetia B.; b. 10 Nov 1922, d. 27 Jul 2014, wife of Phillip Nolen, White Sec. Sherrod, Agnes E.; b. 16 Nov 1839, d. 07 Dec 1908, wife of McHenry Irvin, White Sec. Sherrod, Bessie (Mitchell); b. 27 Nov 1915, d. 14 Mar 1998, wife of Rufus Lowndes, m: 03 Nov 1932, White Sec. Sherrod, Cornelia; b. 27 Apr 1897, d. 16 Sep 1919, White Sec. Sherrod, Eugenia; b. 23 Nov 1860, d. 18 Sep 1920, White Sec. Sherrod, Gordon William; b. 17 Apr 1894, d. 09 Jun 1976, Pvt. US Army WWI, White Sec. Sherrod, Hogue; b. 1867, d. 1942, husband of Stella E., White Sec. Sherrod, Ida H.; b. 11 May 1892, d. 06 Sep 1980, White Sec. Sherrod, Mary Eugenia; b. 17 Oct 1905, d. 19 Dec 1983, White Sec. Sherrod, McHenry Irvin; b. 25 Oct 1829, d. 05 Mar 1903, Co “I” 35th AL Inf. CSA, husband of Agnes E., White Sec. Sherrod, Paul B. Sr.; b. 11 Aug 1921, d. 02 Feb 2004, son of Hogue & Stella E., White Sec. Sherrod, Pearl T.; b. 1891, d. 1955, White Sec. Sherrod, Robert; b. 27 Oct 1789, d. 10 Aug 1853, White Sec. Sherrod, Roulhac; b. 27 May 1917, d. 07 Mar 1942, White Sec. Sherrod, Rufus Lowndes; b. 30 Jul 1912, d. 21 Jan 1998, husband of Bessie, White Sec. Sherrod, Samuel E.; b. 10 Apr 1863, d. 22 Aug 1940, White Sec. Sherrod, Stella E.(Blakely); b. 1883, d. 17 Dec 1960, wife of Hogue, White Sec. Sherrod, W. L.; b. 10 Feb 1855, d. 06 Dec 1920, White Sec. Sherrod, William R.; b. 1803, d. 24 Oct 1818, son of Robert & Elizabeth, White Sec. Sledge, Amy V.; b. 02 Aug 1900, d. 05 Jan 1929, White Sec. Sledge, given name missing; b. 12 Mar 1889, d. 12 Sep 1889, White Sec. Sledge, J. Sterling; b. 03 Jul 1890, d. 28 Sep 1941, White Sec. Sledge, Julia Emma (Cox); b. 22 Jan 1872, d. 30 Aug 1941, wife of Matt, White Sec. Sledge, Mary E.; b. 28 Jul 1892, d. 15 Oct 1915, White Sec. Smallwood, Cheryl; b. 29 Nov 1946, d. 13 Nov 2016, wife of Gary, White Sec. Smith, Darothy; b. 10 Aug 1915, d. 24 Jan 1916, daughter of Robert C. & Susan Missie, White Sec. Smith, Doris (Whitten); b. 20 Nov 1923, only date, wife of Robert G. Jr., m: 06 Nov 1947, White Sec. Smith, Gary P.; b. 14 Jul 1933, d. 08 Jul 1991, White Sec. Smith, Lucile W.; b. 1915, d. 1950, Black Sec. Smith, Martha O.; b. 25 Jun 1903, d. 03 Sep 1996, White Sec. Smith, Myrtle; b. 08 Mar 1903, d. 11 Jan 1915, daughter of Robert C. & Susan Missie, White Sec. Smith, R. C.; b. 04 Oct 1864, d. 16 Sep 1922, husband of Susan Missie, White Sec. Smith, Robert Earl; b. 16 Jul 1898, d. 13 Jun 1963, White Sec. Smith, Robert Ganum Jr.; b. 26 Aug 1925, d. 25 Jan 2004, husband of Doris (Whitten), White Sec. Smith, Robert Ganum III; b. 29 Oct 1948, d. 08 Sep 2010, White Sec. Smith, Susan Missie (Rice); b. 14 Jul 1874, d. 20 Jan 1952, wife of Robert C., White Sec. Springer, James D Jr.; b. 09 Jan 1960, d. 09 Jan 1960, White Sec. Summerhill, Doyle; b. 25 Aug 1903, d. 15 Oct 1983, White Sec. Summerhill, Irma W.; b. 06 Jan 1908, d. 18 Feb 2001, White Sec. Taylor, J. M.; b. 05 Nov 1862, d. 08 Jan 1936, White Sec. Taylor, Josie; b. 23 Sep 1865, d. 10 Aug 1945, White Sec. Taylor, Laura (Murphy); b. 16 Jul 1954, only date, White Sec. Taylor, Velson Vernon; b. 17 May 1937, only date, White Sec. Thompson, Emma Lue; b. 18 Apr 1910, d. 04 Mar 1994, Black Sec. Thompson, Frank D.; b. 31 Mar 1946, d. 20 Feb 1982, Black Sec. Thompson, Mamie B.; b. 11 Dec 1902, d. 11 Jan 1996, Black Sec. Tobin, Lucille; b. 05 Jul 1917, d. 13 Oct 1996, White Sec. Vaughan, George W.; b. 04 Mar 1893, d. 04 Oct 1918, White Sec. Vaughan, John W.; b. 14 Feb 1849, d. 05 Feb 1927, White Sec. Vaughan, Lyda Elizabeth; b. 1897, d. 1952, White Sec. Vaughan, Mary E. (Stutts); b. 29 Mar 1881, d. 31 Mar 1936, wife of W. L., White Sec. Vaughan, Robert Owen; b. 28 Sep 1910, d. 15 Oct 1910, son of W. L. & Mary E., White Sec. Vaughn, Billy; b. 01 Jul 1936, d. 08 Feb 1937, White Sec. Vaughn, Delphia E.; b. 1889, d. 1974, White Sec. Vaughn, George M.; b. 20 Feb 1899, d. 23 May 1971, White Sec. Vaughn, J. A.; b. 13 Jul 1861, d. 21 Aug 1925, White Sec. Vaughn, John L.; b. 1886, d. 1961, White Sec. Vaughn, Martha L.; b. 01 Mar 1937, d. 30 Apr 1941, White Sec. Vaughn, Mattie E.; b. 19 Oct 1881, d. 22 Aug 1969, White Sec. Vaughn, Thomas Jr.; b. 04 Apr 1933, d. 26 Aug 1992, White Sec. Vaughn, Tony; b. 21 Nov 1956, d. 18 May 1989, White Sec. Waddell, Annie Nay; b. 09 Aug 1897, d. 12 Jun 1914, White Sec. Waddell, Julios Blakemore; b. 02 May 1915, d. 12 Apr 1921, White Sec. Waddell, Mamie; 04 Jun 1903, only date, White Sec. Waddell, Rachel E.; b. 05 Mar 1871, d. 07 May 1955, White Sec. Waddell, W. Thomas; b. 01 Sep 1858, d. 03 Nov 1937, White Sec. Walker, Maxine (Rice); b. 23 Dec 1926, d. 28 Jan 1995, wife of Thomas Martin Jr. “Tuck”, White Sec. Walker, Thomas Martin Jr. “Tuck”; b. 06 Aug 1924, d. 02 Mar 2016, White Sec. Wallace, Annie B.; b. 15 Dec 1906, d. 07 Jun 1992, White Sec. Wallace, Clifford L.; b. 14 Jun 1931, d. 16 Jun 1988, husband of Virginia Mae, White Sec. Wallace, Joseph Wheeler; d. 23 Feb 1958, Note: burial location unknown, White Sec. Wallace, Janice Jeanette (Rhodes); b. 03 Jun 1938, d. 28 Sep 2016, wife of 1st Sonny Pruitt, 2nd Sandy Paul Wallace, White Sec. Wallace, Sandy Paul; b. 09 Jul 1942, d. 03 Aug 2003, White Sec. Wallace, Susan (Randolph); b. 07 Jul 1861, d. 24 Aug 1938, wife of James, m: 14 Mar 1883, daughter of George & Elizabeth (Thompson) or may have been Thomasson (obituary taken from August 25, 1938 Florence Times newspaper) NOTE: location of grave unknown, White Sec. Wallace, Thomas E.; b. 25 Jan 1946, d. 29 May 1972, White Sec. Wallace, Thomas S.; b. 04 Mar 1887, d. 15 Oct 1963, AL Pvt. Co. “B” Development BN WWI, White Sec. Wallace, Virginia Mae; b. 21 Nov 1937, only date, wife of Clifford L., White Sec. Walston, Addie; b. 17 Jul 1858, d. 26 Apr 1886, daughter of Rev. James & Harriet C., White Sec. Walston, Elizabeth; b. 1780, d. 05 Sep 1830, White Sec. Walston, Elizabeth A.; b. 1792, d. 09 Dec 1855, wife of Turner, White Sec. Walston, Elizabeth B.; b. 09 Jul 1819, d. 04 Oct 1835, White Sec. Walston, James Rev. ; b. 08 Mar 1817, d. 06 Mar 1886, husband of Lorena, White Sec. Walston, James S.; b. 07 Feb 1854, d. 06 Jul 1854, son of James & Lorena L., White Sec. Walston, John; b. 29 Oct 1822, d. 29 Jan 1878, son of T. & E., White Sec. Walston, Lorena L.; b. 16 Aug 1817, d. 1851, wife of Rev. James, White Sec. Walston, S. A.; b. 11 Jul 1825, d. 24 Jun 1882, wife of Rev. John, White Sec. Walston, Turner; b. 04 Feb 1783, d. 24 Aug 1856, husband of Elizabeth A., White Sec. Watkins, Frank R.; b. 07 Jan 1916, d. , White Sec.19 Aug 1993, White Sec. Watkins, Jesse William; b. 24 Mar 1902, d. 03 Mar 1959, White Sec. Watkins, Julia A.; b. 17 Nov 1878, d. 13 Sep 1949, White Sec. Watkins, Mildred C.; b. 14 Jan 1918, d. 19 Aug 1993, White Sec. Watkins, Robert M.; b. 09 Nov 1897, d. 02 Oct 1927, White Sec. Watkins, Rosa Mae; b. 29 Jul 1904, d. 26 Feb 1988, White Sec. Watkins, Samuel Griffith; b. 18 Sep 1873, d. 09 Aug 1959, White Sec. Watkins, Samuel S.; b. 29 Apr 1904, d. 30 Oct 1929, White Sec. Watson, Eugene; b. 15 Feb 1900, d. 10 Dec 1980, Pvt. US Army WWI, Black Sec. Weaver, Billy Boyce; b. 08 Nov 1940, d. 04 Jul 2010, husband of 1st Diana Lee (Rice), 2nd Gail McMurtrey, White Sec. Weaver, Diana Lee (Rice); b. 08 Nov 1943, d. 19 Dec 1999, wife of Billy Boyce, m: 08 Mar 1973, White Sec. Webster, Dean (Hill), b. 06 Mar 1929, d. 07 May 2012, wife of James J. “Jim”, White Sec. Webster, James J. “Jim”; b. 22 Feb 1929, United Methodist Minister, husband of Dean, White Sec. West, Douglas Ray; b. 08 Jan 1949, d. 07 Apr 2012, US Marines Vietnam, White Sec. Whitten, Henry T.; b. 17 Mar 1886, d. 11 May 1976, husband of Lunie B., White Sec. Whitten, J. H.; b. 1885, d. 1953, White Sec. Whitten, James T.; b. 04 May 1909, d. 08 Nov 1963, AL S1 USNR WWII, White Sec. Whitten, Louise; b. 15 Aug 1914, d. 12 Nov 1918, daughter of Mr. & Mrs. Henry T., White Sec. Whitten, Lunie B.; b. 23 Aug 1887, d. 20 Jun 1978, wife of Henry T., White Sec. Whitten, Mattie; b. 1886, no death date, White Sec. Whitten, Ruby Mae; b. 09 Aug 1912, d. 22 Jan 1913, daughter of Mr. & Mrs. Henry T., White Sec. Whitten, Solon L.; b. 17 Jan 1853, d. 23 Jul 1921, White Sec. Whitten, William Howard; b. 12 Jun 1918, d. 20 Nov 1918, White Sec. Williams, Grady Morris; b. 09 Feb 1969, d. 22 Dec 1997, Black Sec. Winborn, Fancy; b. 25 Dec 1887, d. 25 Aug 1960, Black Sec. Winborn, Sylvia (Andrews); b. 1888, d. 1953, Black Sec. Winburn, Clyde; b. 28 Jan 1952, d. 07 Dec 2005, Black Sec. Winburn, Jesse Sr.; b. 17 Oct 1913, d. 14 Feb 1992, Black Sec. Winburn, Pearl Lee; b. 05 Jan 1924, d. 04 Apr 1986, Black Sec. Woods, Effie; b. 18 Jun 1907, d. 30 May 1993, Black Sec. Wood, Jack; b. 02 Jan 1932, d. 04 Sep 2016, husband of Betty, US Army, Korea, White Sec.